Taken from News Straits Time, July 17, 2017. AS I enter a dollhouse located at the end of a corridor in Empire Damansara, I come face to face with bright pink walls. Not only that, most of the stuff in the soho unit are also in pink. The room reminds me of those backstage dressers in Hollywood movies. There’re a row of tables. Large bulbs surround several mirrors placed in front of the tables. In the middle of the dollhouse, there are tables with small round mirrors and make-up utensils. 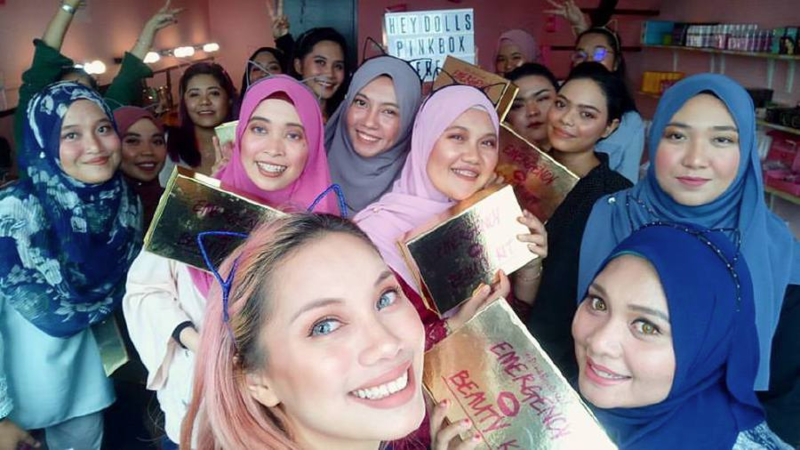 I am at PinkBoxCereal, owned by Nurul Shafiqah Shafie, beauty guru and make-up artist who has quite a following on social media, specifically Instagram. Shafiqah, 26, who goes by the name @Pinkboxcereal on her social media account, runs the beauty cafe with her husband Mohd Iylia Fahmi Azmi. The cafe was initially a place for Shafiqah to store her make-up stocks and organise make-up classes. “But many of my followers like the place as it looks like a dollhouse, with everything in pink. That’s why we decided to open the place for people to hang out to play with make-up. Foreigners who have read about the place also came to have a look and were quite impressed,” she says. Before her venture into the beauty scene, Shafiqah was an AirAsia flight attendant. She has also worked as a copywriter for various outfits. In 2015, she quit her job to pursue her interest in the beauty line. “I enrolled at SUB International School in Berjaya Times Square to learn more about make-up. I also attended skincare classes to enhance my aesthetics skills. 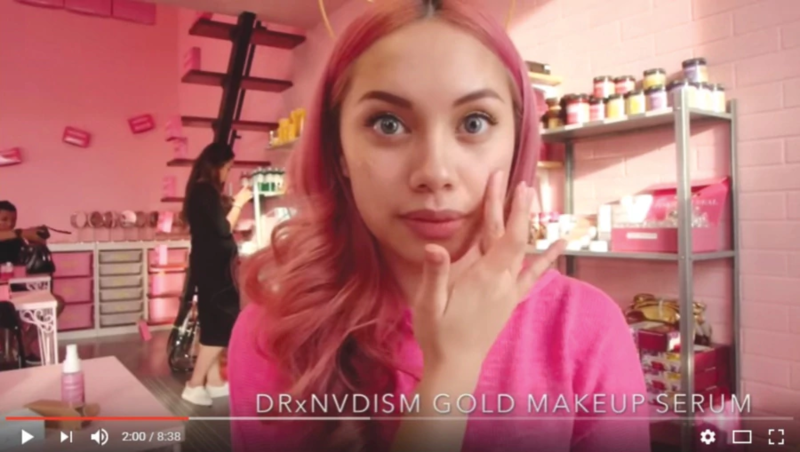 Many of her followers inquired about the products that she uses in the videos, which prompted her to start her online business, @Shoppinkboxcereal on Instagram. 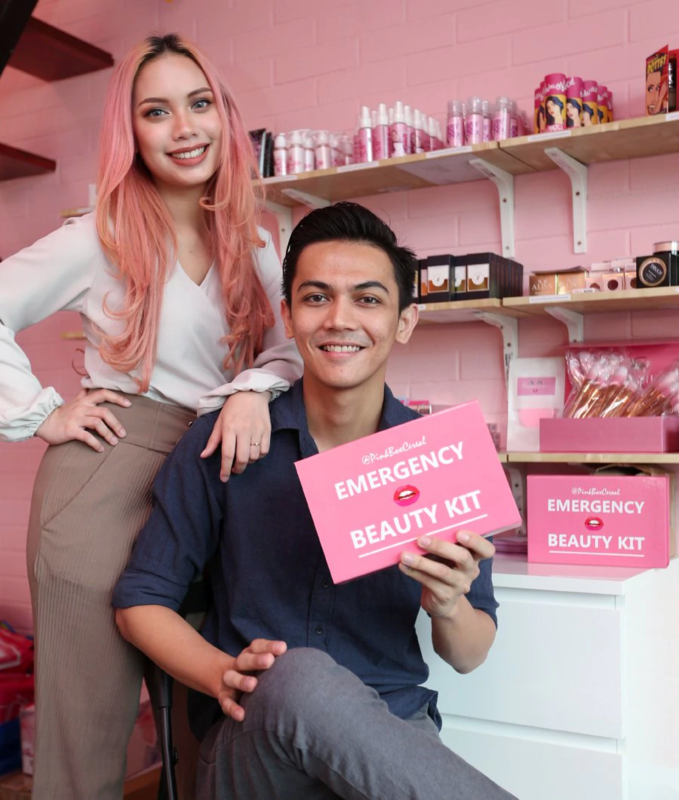 Shafiqah initially catered for orders in a cute pink box, dubbed the Emergency Beauty Kit, depending on customers’ skin concern. With more than 31,000 followers on Instagram and over 50,000 on Facebook, she has to date sold over 100 Emergency Beauty Kits per week through @Shoppinkboxcereal. Shafiqah also launched her skincare brand, which she formulated herself under Pinkboxcereal Beauty. Following the success of Shoppinkboxcereal on Instagram, the couple launched their website (www.shoppinkboxcereal.com) in April this year. Iylia says in the first week, they had over 1,000 customers registering for membership. He says the sale of Emergency Beauty Kits has doubled, and sales are triple since they set up the site. He adds that setting up the website has made their work easier and more organised. “Now we can easily keep track of our database, number of customers and generate charts for sales report,” he says, adding that customers also come from Singapore and Brunei. Online shopping is on the rise because shopping habits have changed over the years. “People prefer to stay at home instead of going out because it’s time consuming. 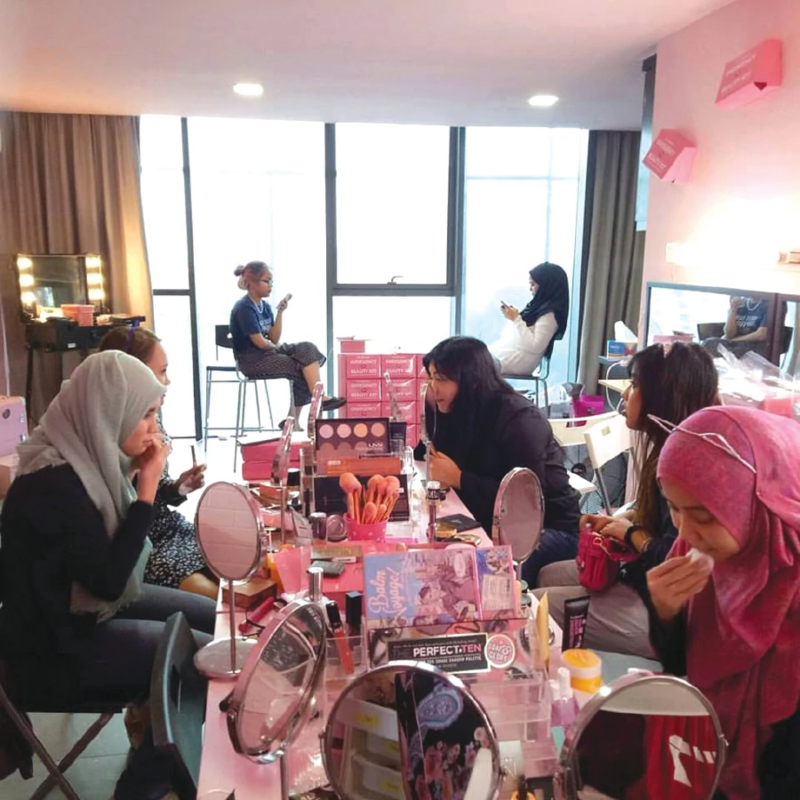 Insurance agent and Pinkboxcereal client Nur Naqiah Jalaludin, 27, says she buys her make-up online because stocks at the shops are limited and always run out. “Sometimes the products are not available, and at times it is cheaper to buy online.